AND TO COMMEMORATE THE ROYAL DIMOND JUBILEE IN 2012. 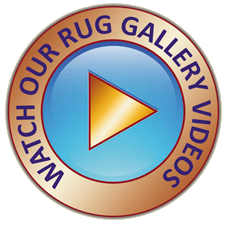 As a quintessential British company, THE ORIENTALRUG GALLERY LTD is dedicated to sourcing and selling the best in hand-woven rug craftsmanship. 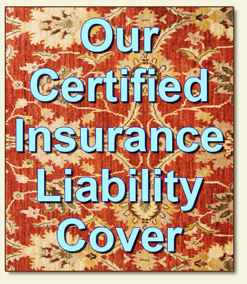 As Rug Specialists, we are passionate in preserving, supporting and keeping alive rug-weaving and embroidery-crafted skills, and using our four generations of Master Rug Craftsman knowledge, skills and professional expertise, to conserve and restore decorative arts heritage and traditional woven crafts. Each piece, in the hundreds of beautiful, hand-woven weavings, individually sourced by Anas and Sandre from the ancient Silk & Spice Route Rug Regions, that adorn The Oriental Rug Gallery Ltd’s interiors, is created in a unique moment of weaving history, time and place, ensuring its legacy as a treasured piece of craftsmanship. 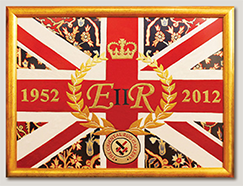 Galvanised by the forthcoming Royal Jubilee occasion, Anas and Sandre – through their passion as skilled artisans – wanted to capture the pomp and regal splendour of Her Majesty’s Diamond Jubilee Commemorations and portray this rich legacy of heritage, by creating a Diamond Jubilee Embroidery, especially commissioned as a ‘Gift for the Queen’. Here, like the principals and ideals of the Arts & Crafts Movement before them – of which many artisans were based in Haslemere and the surrounding Surrey areas, Anas and Sandre were inspired to create a bespoke-crafted piece that would encapsulate the Queen’s 60-year reign, through using an eclectic mix of threads, textures, colour imagery and motif symbolism in its design, while showcasing an array of traditional and specialist embroidery techniques. ANAS AND SANDRE WERE VERY HONOURED AND PROUD TO RECEIVE A PERSONAL 'ROYAL THANK YOU' FROM HER MAJESTY QUEEN ELIZABETH II. A personal Royal Thank You Letter from Her Majesty the Queen was sent ‘special delivery’ and received by Haslemere Mayor Cyndy Lancaster in October 2012. Here, Her Majesty expressed her delight and particular interest for “this special embroidery, created by Sandre Blake and Anas Al Akhoann”. The Royal Letter came with a thank-you photo card marking the Queen’s Diamond Jubilee. 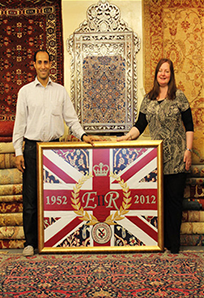 “Anas and I are thrilled to have received Her Majesty’s personal appreciation for the Diamond Jubilee Embroidery, where the Queen took the time to individually mention us by name in her correspondence, which is such a rare and proud honour! 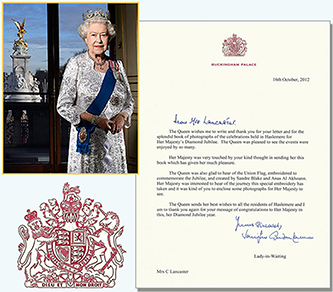 We shall treasure this special Royal Letter of Thanks and cherish the Queen’s kind words of praise for our embroidery’s creation, as an enduring keepsake of the occasion and as a lifetime’s achievement,” said Sandre. 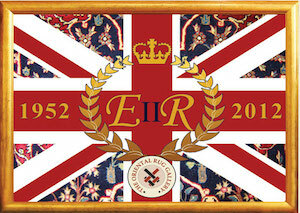 “We are particularly proud and very honoured to receive the Queen’s royal approval for the Diamond Jubilee Embroidery. 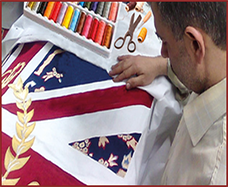 We remember and give thanks to all those, whose endeavours helped us to create this unique embroidery, as a fitting tribute to commemorate Her Majesty’s Diamond Jubilee Celebration,” said Anas. 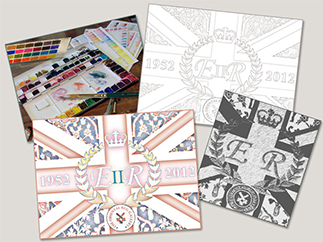 The first stage of creating the Diamond Jubilee Embroidery Gift for the Queen began with Anas and Sandre creating a visual inspiration board of ideas, where initial design concepts for their proposed bespoke Embroidery began to take form. Next, Sandre assessed the measurements for the three component crosses incorporated in the Union Flag, more often called the ‘Union Jack’, which were to be depicted in the proposed embroidery design. These initial calculations were needed to encompass the slight pin-wheeling of the St Patrick's and St Andrew's crosses in conjunction with the overlay of the St George cross, known technically as ‘the counter change of saltires’, to ensure the Union Jack flag would be designed the correct way up. Based on these calculations, Sandre created a line drawing of a Union Jack flag, that encompassed these exact measurements, where they could be scaled up to size. 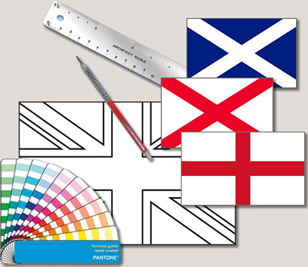 Next, she colour-matched the Union Jack Flag’s tricolours, where these colour and measurement specifications would be vital for the embroiderers, as a guide for hand-crafting the main body of the embroidery design. became the inspiration for Anas and Sandre to choose one of their rare and antique weavings: a Tehrani Carpet hand-woven in silk and wool, whose floral motifs would be replicated by Sandre, to form the ‘royal blue’ background, in their Diamond Jubilee Embroidery’s ‘Union Jack’ design. Here, the carpet’s finely crafted, floral-embellished weave highlights The Oriental Rug Gallery Ltd’s ‘treasure-trove of beautiful hand-knotted weavings’ legacy, while helping to create a unique ‘signature’ piece for Her Majesty the Queen. With the initial ideas for the embroidery taking shape, Sandre draughted a series of preliminary pen and ink drawings – blending together royal heritage research, a hand-drawn carpet motifs patterned background, with possible design concepts, layouts and colourways. Next, she made some cross-hatched sketches, followed by a series of water-colour ‘roughs’ that further honed and developed specific features that both she and Anas wished to include in the embroidery’s design. To create impact, Anas and Sandre wanted to depict a graduated, gold-coloured laurel wreath motif that would surround and encase the Queen’s Royal ‘ER II’ cypher. 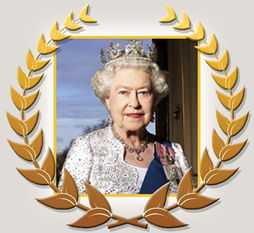 As a traditional and ancient symbol, the laurel wreath symbolises regal status and moral virtue in its highest form, while the bay leaves in the wreath symbolise strength, courage, honour and continued commitment – as a fitting tribute to Her Majesty’s 60-year reign as our Queen. Further research revealed that in 1707, with the aegis of Queen Anne (an ardent supporter towards Union) and her ministers, two Acts of Union were agreed. These Acts now joined the Kingdoms of England and Scotland – having previously been separate states with separate legislatures, but with the same monarch, as augmented by James I – into a single, unified kingdom entitled: ‘Great Britain’, where the ‘Union’ flag became the nationally recognised flag of this United Kingdom. 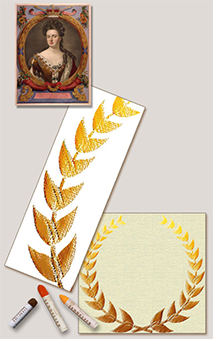 Here, Sandre created 12 graduating levels of bay leaves in the laurel wreath design, to represent the Royal succession of 12 British monarchs – from Queen Anne to Queen Elizabeth II, to embrace this historical legacy. First, she sketched a series of pencil roughs formulating the initial laurel wreath on to paper, with the finalised wreath designs being drawn out and applied in oil pastels to textured board. Here, the board’s grainy finish would help simulate a raised ‘Goldwork’ textural effect for the wreath template. As part of the embroidery’s design process, and once all the individual motif templates, samplers and roughs had been created, they would be layered together to form various montage sample layouts, so that Anas and Sandre could then choose the motif arrangement best suited for their proposed embroidery design. 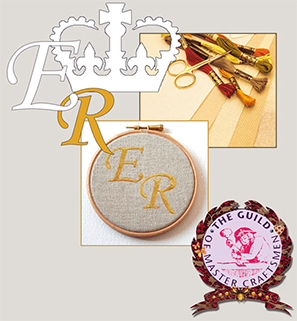 Next, Sandre carefully mapped out paper samples (in varying sizes and fonts) of the crown motif and the Queen’s Royal Cypher – detailing the ‘Elizabeth Regina’ monogram and reigning years number motifs, for the proposed Diamond Jubilee Embroidery design. After Anas and Sandre had reviewed and then chosen the samples that best suited the design, Sandre carefully pinned these paper samples to fabric, and then marked up and cut out a series of fabric templates. Next, she hand-tacked these fabric templates on to a linen-base, and then placed this textile montage in an embroiderer’s tension hoop, to hold it taut. Once in place, she then over-stitched the fabric templates, using filigree gold thread, to form ‘embroidered samplers’. These samplers, along with the design roughs she created earlier, would be used by the embroiderers, commissioned to help craft the piece, to colour-, thread- and size-match the embroidery design, while applying the techniques and materials Sandre and Anas had researched and designed for its bespoke creation. In a tradition dating back hundreds of years, Damascene weavers and embroiderers were commissioned to create the original Damask silk that was inlaid within the ceremonial robes worn by her Majesty the Queen during her Coronation in 1953, whose precious materials also included: cloth-of-gold, silk, satin, ermine and sarsnet. Renowned for their beautiful craftsmanship through the ages, Damascene weavers and embroiderers have been historically employed and are much sought-after around the world, for their skill in crafting royal and ceremonial robes, vestments and coronational decorations. 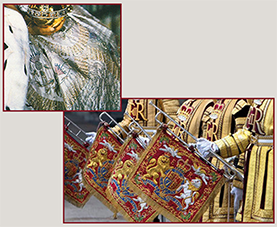 The State Trumpets, heralding the moment of the Crowning of Kings and Queens at Westminster Abbey, have traditionally been hung with specially commissioned Goldwork-embroidered, red, Damask silk banners. 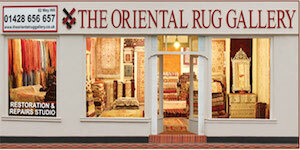 Once all the templates, samplers and drawing roughs were completed, Anas and Sandre rolled back the floor rugs display in The Oriental Rug Gallery Ltd, to reveal a large flat space. Here, they could review their proposed montage sample layouts of the motifs they had created, spread out before them. Having decided on the montage arrangement they wished to use as their embroidery design, it was then photographed as a ‘flat relief’. Next, Sandre used this printed flat-relief to create a ‘Visual Design Spec’ – similar to an architectural plan or interior design mood boards – detailing all the elements of the design, as a guide for the embroiderers to use, when crafting the piece. Here, she included: measurements, thread colours and yarn types, textural specifications, and the design scaled-to-size information. Once produced, the Visual Design Spec was carefully rolled and then packaged with the crafted design samplers. The proposed embroidery design was then shipped to Damascus, where members of The Damascene Embroiderers Guild were awaiting its arrival. As part of the collaborative design process, and having carefully searched for skilled craftsmen to undertake these high-end works, Damascene embroiderers were commissioned to help craft the Diamond Jubilee Embroidery, in homage to Her Majesty’s original Damask Silk Coronation robes. Thereby weaving together, threads of ancient traditions, royal heritage, visual design, and the age-old art of embroidery craftsmanship. In-house at the embroidery workshops, the embroiderers began by carefully mapping out the Diamond Jubilee Embroidery design outline by hand, onto a Damask plain-weave, linen ground. Next, threads of fine silk were individually hand-dyed, spooled and then colour matched to the original Visual Design Spec and samplers provided, to ensure the best and closest representation possible. The linen was then mounted onto a embroidery wooden stretch frame, to ensure an even tension of thread and material, while the works were being crafted for the piece. 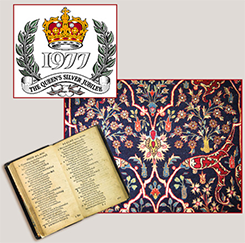 Although the embroidery was being created as one entire piece, individual aspects of the design such as: the Tehrani carpet floral motifs, the laurel wreath, the crown, the individual numbers and lettering motifs, and The Oriental Rug Gallery Ltd’s signature logo were all individually applied over the base relief of the embroidery in Goldwork, Crewel Work and Silk Work, thereby giving the stitched threads a raised, three-dimensional aspect within the embroidery, and heightening the motifs’ details. As Masters of their craft, The Damascene Embroiderers Guild excel in works, where an embroidery blends together traditional and specialist embroidery techniques such as ‘raised’ and ‘flat’ Goldwork, Crewel work and Silk work. Here, silk and gold metallic threads are interwoven in varying hues, and then meticulously embroidered onto a damask plain-weave linen ground. Goldwork, is a technique that uses varying shades of twisted gold silk and metal embroidery threads, to create a luxurious sheen on decorative pieces. The elite of royalty and nobility, Goldwork has traditionally been applied to high-end embroidered pieces for Royal Ceremonial robes, Chivalric, Peer and Parliamentary vestments. Crewel Work is a decorative form of embroidery that follows a design outline applied to fabric and is traditionally worked on a linen ground, which also forms part of the design. This embroidery technique is at least a thousand years old and was most notably used in the depictions of French Tapestries and Jacobean embroideries. Linking back to James I’s reign (the Jacobean era was named after him), when the initial conception of a ‘Union Flag’ was first decreed in 1606. Once the main body of the embroidery was completed, it was carefully packed in muslin and shipped back to The Oriental Rug Gallery Ltd, to continue its journey of creation. Upon arrival, Sandre first reviewed the array of works already completed and then marked up the areas of the embroidery still needing completion and the ‘final touch’, which would be undertaken by Anas – The Oriental Rug Gallery’s Master Craftsman. Next, Anas meticulously applied the professional ‘hand-finishing’ works and the ‘edging’ of the piece. Applying specially dyed threads that he had colour matched to the original embroidery, he hand secured the woven threads, thereby completing the decorative embellishments for the piece. Now complete, the embroidery was ready for mounting and encasing. First, it was carefully stretched and then mounted onto specially-devised protective backing, before being encased in a gold gilt frame, with non-reflective UPVC-enhanced glass to protect the embroidery from wear and tear. 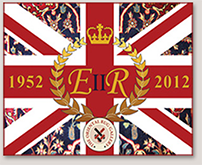 This unique, bespoke commemorative Diamond Jubilee Embroidery took 13 months to create, from initial conception through to designing and crafting, and measures 1270 mm x 970 mm. Only the finest quality, hand-spun silk, metallic threads and hand-dyed, spun cotton threads were included in its creation, where all is meticulously embroidered onto a damask plain-weave, white linen ground. WITH THEIR COMBINED MASTER RUG CRAFTSMEN SKILLS AND EXPERTISE AND SPECIALIST ARTISAN KNOWLEDGE, ANAS AND SANDRE ARE PASSIONATE ABOUT SUPPORTING AND KEEPING ALIVE RUG-WEAVING AND EMBROIDERY-CRAFTED SKILLS. As well as a shared passion for all things hand-woven that is The Oriental Rug Gallery Ltd, Anas and Sandre’s long-held, creative vision is to establish a philanthropic legacy of bequeathed woven and embroidered artworks. Thereby creating and producing works of decorative beauty that not only inspire, but also serve to highlight the preservation of heritage through traditional craftsmanship skills and, in doing so, create a rich and vibrant legacy for future generations to enjoy. Upon completion, the Diamond Jubilee Embroidery Queen’s Gift continued its journey at The Honorary Unveiling and Formal Presentation Ceremony. Here, the High Sheriff of Surrey Mrs Karin Sehmer, was the honoured representative for and on behalf of Her Majesty Queen, accompanied by the Deputy Lieutenant of Surrey Colonel Nicolas Davies. 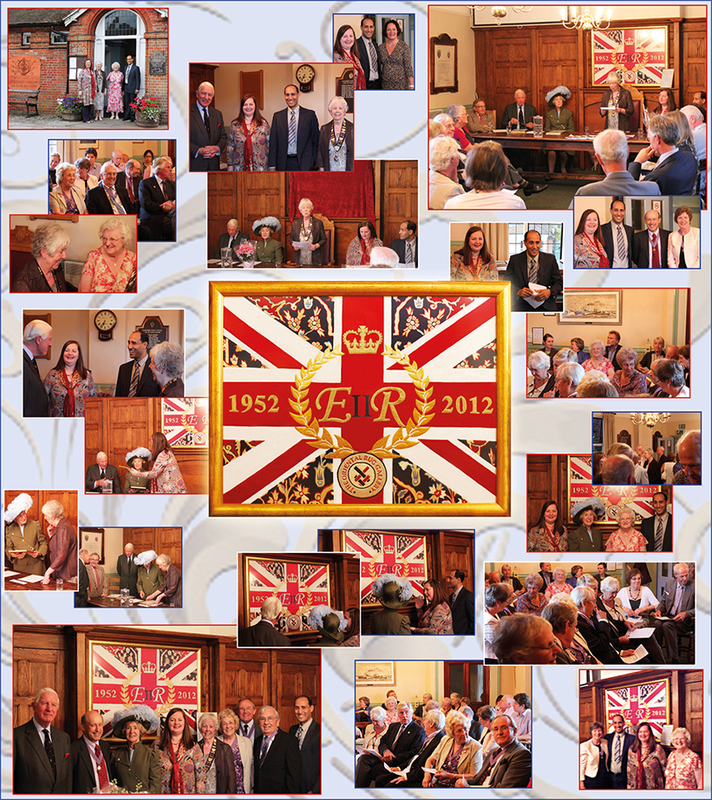 This special occasion took place at Haslemere Town Hall on 22nd August 2012, where Haslemere Town Mayor Mrs Cyndy Lancaster presided over the honorary proceedings, with dignitaries, councillors and invited guests in attendance. The High Sheriff in turn, formally presented the Embroidery to Haslemere Mayor Cyndy Lancaster: “I am honoured and delighted to accept this exquisite embroidery on behalf of the Town Council, as the chosen custodians in perpetuity,” said the Mayor during her acceptance speech. 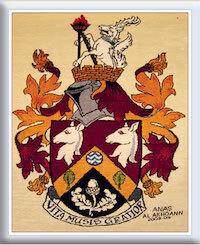 Prior to the The Honorary Unveiling and Formal Presentation Ceremony, a Special Dispensation had been granted, thereby allowing Anas and Sandre to bequeath their Diamond Jubilee Embroidery Queen’s Gift to Haslemere Town Council to reside at Haslemere Town Hall, where they are now the proud custodians of this bespoke piece for and on behalf of Her Majesty the Queen, in perpetuity. 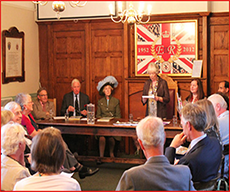 The Dispensation and bestowal was made in recognition of Haslemere’s Mayors and Councillors in office, assisted by the Town Clerk, for their unstinting commitments and endeavours through the years, in working with and on behalf of the community, as the elected representatives for the Town. 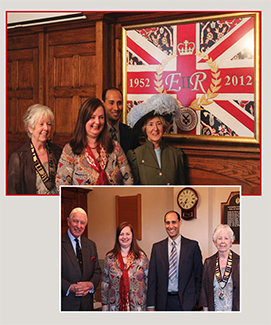 “We hope the Diamond Jubilee Embroidery, now entrusted to the custodial care of Haslemere Town Council, will not only inspire, but also enrich the lives of its viewers through reflecting the pride of being a British Citizen with her Majesty Queen Elizabeth II as our sovereign, for many years to come,” said Sandre. The Union Flag design set within the Diamond Jubilee Embroidery is truly a symbol of unification, where this crafted piece is a poignant reminder of how humanity can work together in a multitude of creative ways, to produce an inspiring and enduring legacy that positively reflects our Town’s affections, our pride in being British Citizens, as well as celebrating Her Majesty the Queen’s Sovereign rule and Royal heritage. This ‘unification’ continues, where Her Majesty’s jurisdiction is relayed through the undertakings of her representatives: the Lord Lieutenant and her Deputies, the High Sheriff, and with our Mayors, Councillors, and the Town Clerk. 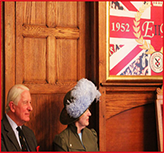 The Diamond Jubilee Embroidery is now in the Trusteeship and Custodial care of Haslemere Town Council at Haslemere Town Hall in perpetuity. 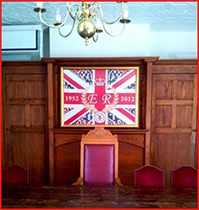 The Embroidery has been installed and now takes pride of place inset within the Jacobean-style wooden panelling above the Mayor’s Chair, in the Council Chambers.